Polypropylene ribbed body. Solid brass blades for long life and low heat rise at full load. Converts 2 pole polarized outlet to 3 wire grounding outlet. Safety tab extends face on adapter to assure grouping plug cannot be plugged in incorrectly. 15 amp, 125 volt. UL Listed. Connects a 3-conductor grounded plug to a 2-conductor polarized receptacle. Primelight? indicator light shows when the power is on. Grounding retainer ring. 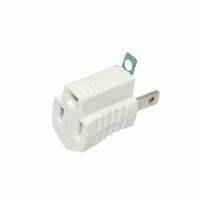 Size:1.20" D X 3.90" W X 6.75" H.
Connects a 3-conductor grounded plug to a 2-conductor polarized receptacle. 15A/125V/1875W. UL Listed, (file no. E15055). Meets all UL 496 and 498 requirements. CSA certified, (file no. 1739 (6231-04). NOM Certified. Temperature rating: -40 to +65 degrees C. 250 volt, 660 watts. Converts one outlet to three grounded outlets.